Basque is a region in the Northwest of Spain, that has a very vibrant and rich culinary history. 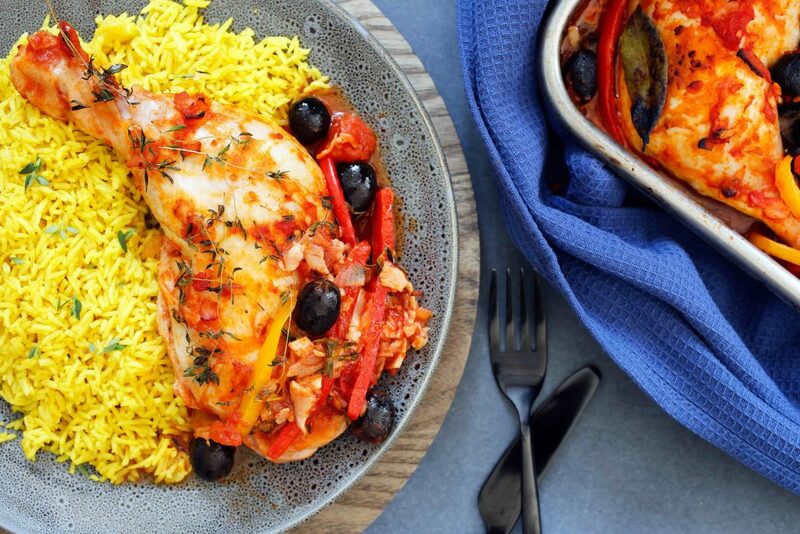 Basque Chicken is comprised of popular ingredients from the region such as capsicum, olives and paprika making it a family hit. This recipe has Super Skinny, Low Carb and a Tray Bake variation. Just did a freezer dive….2 thighs in sauce! Having a hard time deciding between Nik’s cacciatore (THMII) and this one, but the tanginess from this might just have the upper hand….love SM leftovers when OH is away! The ALTOS Basque Chicken is brilliant, full of flavour and texture. I added diced bacon instead of ham as itwas all I had in the fridge but even the usual olive-avoiders ate the entire dish with great enthusiasm. The 2 leftover pieces disappeared in a midnight raid as well. Served with the Spanish Rice and crusted cauliflower it was a huge success. Thank you. Dear god it was yum. Thanks for another amazing recipie. Such lovely flavors in this dish and its so quick. I used chicken breast and it was really tender. I can’t wait to try the rice bake version. 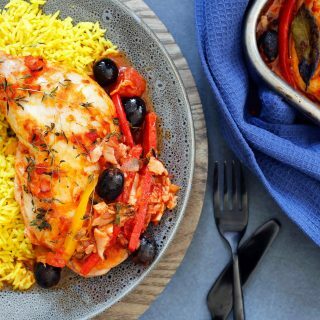 I have always been so fussy and would never have tried these types of dishes without skinnymixers. I am so confident with your recipies and flavours that i will try so many new things now. Thanks Nikalene and the whole SM team.